• Edward Teller, the “father of the H-Bomb,” relentlessly promoted a plan to use 300 nukes to build a second Panama Canal. 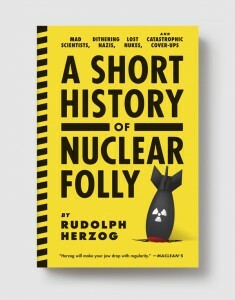 • Atomic technology ended up in many places where it didn’t belong: Reactors were used to power satellites, some of which crash-landed and triggered nuclear emergencies. A plutonium battery was also installed at the top of the Himalayas . . . and lost. • There’s a derelict research reactor in the middle of Kinshasa, Congo, which was built by an eccentric Belgian missionary. The reactor is falling apart, and several uranium fuel rods have been stolen. • John Wayne died of cancer, as did 46 members of the crew of The Conqueror, a notoriously bad B-movie shot in a contaminated canyon near the Nevada nuclear testing range. • About 40 nuclear weapons were lost during the Cold War, some in populated areas in the U.S. Some almost triggered, others were never retrieved. • Nazi scientist Gernot Zippe was captured by the Soviets and forced to build the uranium centrifuge, which was used by Iran, Pakistan and North Korea to build bombs. RUDOLPH HERZOG is the author of Dead Funny: Humor in Hitler’s Germany. His documentary on humor in the Third Reich, Laughing With Hitler, scored top audience ratings on German Channel 1 and was also broadcast on the BBC. He is the son of the celebrated filmmaker Werner Herzog. JEFFERSON CHASE is one of the foremost translators of German history.